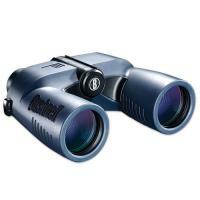 Bushnell 137570 7x50mm Marine Binoculars with Digital Compass 137570 FREE SHIPPING! Bushnell's 7x 50 mm Marine Binoculars with Digital Compass (model 137570) offer an excellent high-end viewing experience with all the protective features you need even in the wettest, salt-water environment. Bushnell's usual binocular features are ramped up for the marine model, offering not only fully waterproof and fog-free viewing pleasure but also salt water corrosion resistance. It's a buoyant device and the O-ring has been hermetically sealed and nitrogen-purged to help keep out moisture, so there's no need to freak out if you happen to drop these in the water. This digital model includes an LCD display and built-in range reticle to help to judge distance. The 3-axis digital compass with TILT offers heading, pitch and direction based on the horizon. As you'd expect from Bushnell binoculars, these offer a crisp, clear view thanks to BaK-3 Porro prisms and multi-coated optics but this model also included 100% UV protection to help protect your retinas. These also have rubber armor that adsorbs shock and maintains a comfy, no-slip grip even when wet. ©2002-2019 CopsPlus.com: Bushnell 137570 7x50mm Marine Binoculars with Digital Compass 137570 FREE SHIPPING!